Billie started getting into punk rock when a few kids in town let him listen to tapes they had. He met Mike Dirnt at school when he was 10 years old and they became fast friends. They shared a love for music and decided to start a band. The rest is history! At age 12, Billie wrote his first song, "Why Do You Want Him?" which is included on "1,039 Smoothed Out, Slappy Hours." In 1990, Billie met his soon-to-be girlfriend, Adrienne Nesser at a concert they were playing. In the summer of 1994, they were married in a ceremony that lasted only 5 minutes! In March of 1995, they had their fist son, Joseph Marcicano Armstrong. Green Day's 4th album, "Insomniac," was released later that year, and named so because Billie said he has many sleepless nights with his son! On September 12th, 1998, Billie and Adrienne had their second son, Jacob Danger Armstrong. 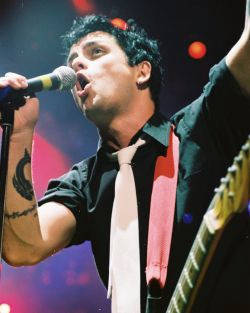 In addition to playing guitar and singing lead vocals, Billie can also play the piano, harmonica, drums, and mandolin. He is also the co-founder and part-owner of the record label "Adeline Records."